Shortages of skilled construction professionals and trades could jeopardise delivery of the UK’s massive construction project pipeline, according to a report from the London Chamber of Commerce and accountants KPMG. A major skills crisis is developing that means 20% more workers are required to meet the 2014-17, £96Bn pipeline of projects in London and the South East, the report says. The £96Bn figure is likely to be exceeded as more projects are brought forward in the growing economy. 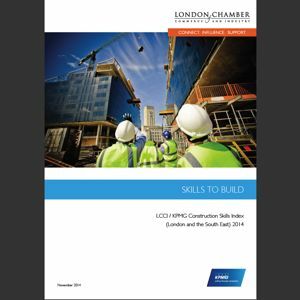 The London Chamber of Commerce and Industry (LCCI) and KPMG’s ‘Skills to Build’ report says that a 51% increase in training provision would be required to meet demand for skilled labour between 2014 and 2017 to plug a gap of nearly 15,000 people. It adds that unless the supply of construction skills is increased, house building targets will not be met and the delivery of large infrastructure projects will be jeopardised. Some 255,000 workers are needed on site in London alone to deliver the 2015 pipeline of housing. KPMG UK Head of infrastructure, building and construction Richard Threlfall said: “For the first time in many generations, the UK has a strong pipeline of construction and infrastructure projects to reinvigorate the economy and drive our future competitiveness. The report says Infrastructure UK should drive a commitment to embed skills and employment requirements in public procurement contracts, aimed at Tier One contractors and suppliers. It also calls on the Skills Funding Agency to convene industry bodies and representatives to design training and apprenticeship frameworks reflecting modern methods of construction.